Sara Foster has two markets in the Research Triangle area of North Carolina. The area includes Duke University, The University of North Carolina at Chapel Hill, and The Research Triangle Complex. So much happens in this incubator of thought, science, software and medical research. The people drawn to this part of North Carolina are highly educated, enviromentally aware and demanding about what they eat. It was the perfect place for Sara Foster to open her food emporiums. Sara worked for Martha Stewart in the early years of her career and long ago branched out into her own style. She has written several cookbooks and is recognized for her approach to cooking which involves simple honest food prepared with local and seasonal ingredients. Her cookbooks inspire me. Over the Easter holiday we traveled to the coastal area of North Carolina. While skirting Chapel Hill I suggested to David that we stop at Foster’s Market for lunch. OK this is something that you need to know about me. I take any and every opportunity to experience an interesting meal. Forget the fast food joints; I want “an experience” of unique eats. Why waste your time on mediocre meals? So we got off of Interstate 40 and proceeded to Foster’s Market. It is not far, but our GPS gets confused. I hate my “Betty” sometimes. I thing she is trying to land us in a dump or no man’s land. Right before we arrived at the restaurant on the left of Martin Luther King Blvd, Betty sent us to the right through a winding neighborhood and landed us back on the right street to turn back to the left for a few yards. Evil Betty! That’s why my next picture is crooked. I was upset. The Chapel Hill branch of Foster’s Market is not as funky as the Durham restaurant, but is set up in the same manner. Orders are placed in front of a display case of delicious looking salads. You have your choice of interesting sandwiches, soups and salads. There is also a bakery, shelves of jams and mixes, and a wine section. One of the unique offerings of the restaurant is a weekly dinner offering for take out. You sign up by Friday of the week before and on Monday you can pick up dinner for 5 nights, all packaged and ready to heat in the oven. Check it out here. Many of the current offerings are from Sara’s new cookbook Sara Foster’s Southern Kitchen. Click here to view all of her cookbooks. We had the soup and sandwich combination featuring pork and black bean soup with a ham and cheese panini. I didn’t get a good picture of our food but this is what the market looks like on the inside. In honor of the upcoming Cinco de Mayo holiday, I made Sara Foster’s Southwestern Shepherd’s Pie with Chicken and Chili Mashed Potatoes. It is in her Foster’s Market Cookbook. If you are short on time you can use a rotisserie chicken. There is a little heat to it, but not much. It is an interesting take on shepherd’s pie and we loved it. It was both homey and satisfying. Heat the olive oil and butter in a large skillet over medium heat. Add the onion and cook, stirring frequently, until slightly brown, about 5 minutes. Add the celery, red bell pepper, and green bell pepper and cook 3 minutes more, stirring occasionally. Add the garlic and jalapeno and cook 3 minutes more, stirring occasionally. Add the flour and cook, stirring constantly, until the flour starts to brown slightly, about 5 minutes. Add the chicken and wine and stir until the wine begins to evaporate, about 1 minute. Slowly add the chicken broth, and continue to cook, stirring frequently, until the mixture begins to thicken and coats the back of a spoon. Reduce heat to low, bring the mixture to a low boil, and cook 5 to 10 minutes or until the mixture thickens and is creamy. Remove from the heat and add the parsley, thyme, red pepper flakes, and corn. Season with salt and pepper and transfer the mixture to a 9 by 13-inch baking dish. To make the chili mashed potatoes, Mix basic mashed potatoes with 1 teaspoon of the chili powder in a bowl until well combined. Spoon the chili mashed potatoes on top of the chicken and bake 20 to 30 minutes or until the potato peaks are slightly brown and the chicken mixture is bubbling around the sides of the dish. Remove from the oven, sprinkle with the remaining chili powder and the parsley and thyme, if desired. Serve immediately. Posted on May 3, 2011 at 8:26 am. As a side dish or a condiment to compliment other dishes, this sweet potato salsa cannot be beat. While researching recipes for my pool party, I was drawn to this dish because it was suggested as a topping for the chipotle maple barbecued brisket. To my way of thinking, it can stand on it’s own. As a matter of fact, I am going to serve it in place of potato salad. It is just as good at room temperature as it is warm from the oven. The sweet potato chunks are baked in the oven with oil, balsamic vinegar, chili powder and ground cumin. There is something about the balsamic vinegar and spices that inspire me to dig into this dish and keep eating. You can adjust the heat in the dish by cutting back on the jalapeno peppers. Because I will be serving a crowd, I will go easy on the peppers and I think I will substitute parsley for the cilantro. Not everyone loves it and for those who don’t, it is usually a true aversion. Sara Foster has hit another homerun with this salsa. For those of you who are not familiar with her, I wrote about her here. There is nothing in her cookbooks that I would not be pleased to put on my table. 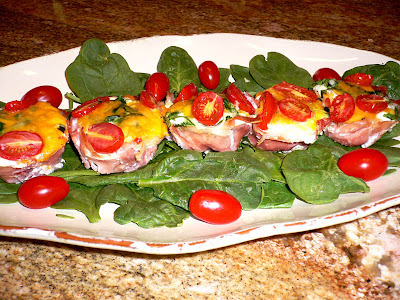 Next up, BLT wraps with sun-dried tomatoes. This recipe testing is playing havoc with my weight loss program. Place the sweet potatoes on a baking sheet with sides. Drizzle with the olive oil and vinegar, sprinkle with the chili powder and cumin, and toss to coat. Spread the sweet potatoes in one even layer and roast for 30 to 35 minutes, stirring occasionally for even browning, until the potatoes are golden brown and tender. Set aside to cool. Scrape the sweet potatoes into a large bowl. Add the tomato, bell pepper, jalapeno pepper, scallions, parsley, lime zest and juice, salt, and pepper, and toss to mix. Season with additional salt and pepper to taste and serve warm or at room temperature. Posted on March 7, 2011 at 8:24 am. Bacon and eggs are such an expected and loved breakfast entree. There are so many ways to serve them and I considered frittatas and stratas and even flirted with the idea of a savory clafouti. But in the end I chose this proscuitto egg cup dish. 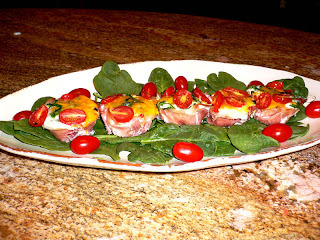 I saw it in Sarah Foster’s latest book Sara Foster’s Casual Cooking. I talked about Sara Foster here. This is just the kind of breakfast offering she would choose for Foster’s Market. For people on the run in the morning it makes a nice hands on kind of treat. But you can eat it with a fork if you serve it at brunch. The cups are in no way delicate and if you wanted to, you could serve them on a tiered cake stand. They have the advantage of being pretty to look at and easy to prepare. You can double the recipe for a crowd and you can assemble them ahead of time and pop them in the oven right before your brunch. Sara says that they are good warm or at room temperature. I liked mine fairly fresh from the oven. Preheat oven to 350 degrees. Grease a 6 cup muffin tin. Line each cup with one slice of proscuitto, overlapping as you go. Break one egg in each cup. 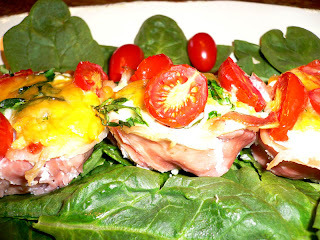 Top with shredded spinach, shredded cheese and as many halved tomatoes as will fit. I used 3 halves per cup. Bake for 15 to 18 minutes. The whites of the eggs should be set and the yolks should be just a little runny. Let rest in the muffin tin for a few minutes. Run a sharp knife around the outside of the muffin cups and ( I found ) using an off set spatula lift the egg cups out to a serving platter. Recipe can easily be doubled. As a disclaimer, I did not have Sarah’s recipe in front of me, but this is as I remember it and the results were delicious. Posted on May 22, 2009 at 9:22 am. North Carolina is fortunate to have many fine cooks and chefs. And we are fortunate that Sara Foster chose to move here in 1990. Her career in cooking took her from her roots in rural Tennessee to New York City where she attended culinary school, worked in restaurants, and became a part of Martha Stewart’s catering team. She eventually branched out on her own and opened her own catering business in Greenwich, Connecticut. One of her dreams had always been to open a gourmet food market and cafe and she found the perfect location for it in Durham, North Carolina. Foster’s Market became so successful that she opened a second store in Chapel Hill in 1998. I have visited the Durham Foster’s Market on several occasions and was impressed with the array of food available for take-out and wished that I lived close enough to pop in after work to pick up chicken and dumplings or slow roasted pork shoulder with Foster’s applesauce. As it was I had to settle (by no means a hardship) for lunch ordered at the counter and eaten in the funky, but charming dining room. Sara Foster has written three cookbooks and I own two of them, one signed by Sara herself. Her first cookbook is The Foster’s Market Cookbook which features recipes from the kitchen of Foster’s Market. I especially like the variety of sandwiches and salads that are included. The second cookbook is Fresh Every Day which is geared more to the home cook and includes food that Sara cooks in her own kitchen. She believes in “simple honest food prepared with fresh local and seasonal ingredients”. To illustrate this philosophy she offers four sauteed shrimp recipes. 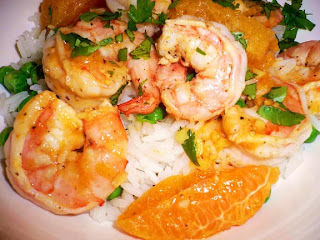 For Winter, the recipe is the one I cooked today – Sauteed Tangerine Shrimp. For Spring, the recipe is Garlic Sauteed Shrimp with Spinach. For Summer, the recipe is Sauteed Shrimp with Corn and Tomatoes and for Fall, the recipe is Curry Coconut Shrimp. 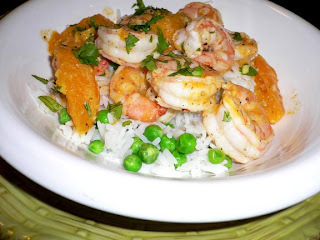 I can honestly say that the sauteed tangerine shrimp were simple and flavorful and I am looking forward to the other seasonal shrimp recipes. I served the shrimp with jasmine rice and peas. The warmed sections of tangerine in this dish are a sweet surprise with the shrimp. If you can find them, use clementines, a Mandarin orange variety that comes from Spain. Not only do they have extra flavorful tangy-sweet flesh, clementines are a breeze to peel – and they have no seeds! 1. Combine the tangerine juice and sections, ginger, garlic and shrimp in a bowl and toss to coat the shrimp. Cover and refrigerate to marinate for 2 to 3 hours. 2. Heat half of the oil and half of butter in a large skillet over medium-high heat until the butter melts. Remove half the shrimp from the marinade, reserving the marinade, season with salt and pepper, and place in the skillet to saute for 1 to 1 1/2 minutes per side, until they turn pink. Place the shrimp on a platter covered loosely with foil to keep warm. Add the remaining butter and oil and cook the remaining shrimp. 3. When all the shrimp are cooked, pour the marinade and tangerine sections into the skillet, increase the heat to high, and boil the marinade until it has reduced by half, about 30 seconds. Turn off the heat and stir in the cilantro. Season with additional salt and pepper if needed and serve the shrimp warm with the tangerine sauce and sections spooned over them. Posted on March 4, 2009 at 3:06 pm.